The most influential people in European fashion right now. Wow, been named like that is quite impressive when you read it, to be honest. 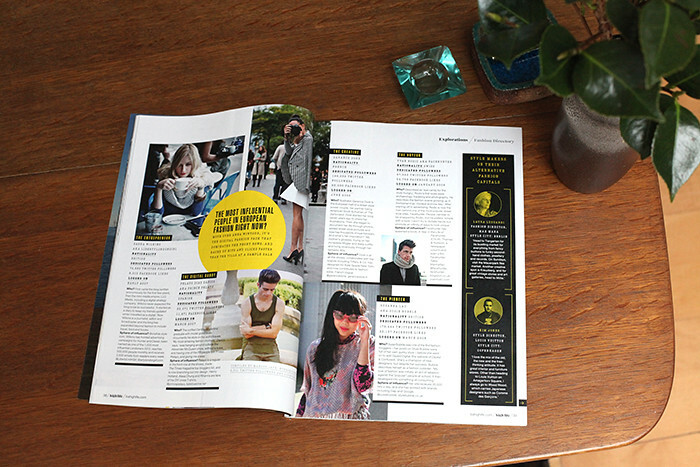 This has been the biggest compliment of the year so far and the fact that I´m in such good company makes it double compliment: Susie Bubble (stylebubble), Yvan Rodric (facehunter) Sasha Wilkins (libertylondongirl), Garance Dore (Garancedore) and I were the dream team chosen by High Life, a magazine that goes on the back seat of every British Airways flight so make sure you get your copy on your next trip! Thank you High Life team! Los más influyentes de la moda en Europa en este momento. Wow, que te mencionen así impacta un poco cuando lo lees, si os digo la verdad. Este ha sido el mayor piropo del año hasta el momento y el hecho de estar tan bien acompañado en el articulo lo convierte en doble piropo: Susie Bubble (stylebubble), Yvan Rodric (facehunter), Sasha Wilkins (libertylondongirl), Garance Dore (Garancedore) y yo fuimos el equipo perfecto elegido por High Life, una revista que va en la parte de atrás de absolutamente todos los vuelos de British Airways, así que asegurate de coger tu copia en tu próximo viaje! Muchas gracias al equipo de High Life!